My cat Nemo has a favorite rag. It’s like a security blanket. He keeps the thing outside, but he carries it around with him. He plays with it. He sleeps with it. He keeps it in safe spots. Oliver, a neighbor cat, is a glove thief. If I leave my garden gloves outside, chances are I’ll be missing one (or both) before long. I’ve seen him carrying them across the yard. Where does he take them? Why does he take them? Does he think he’s playing a joke on us? 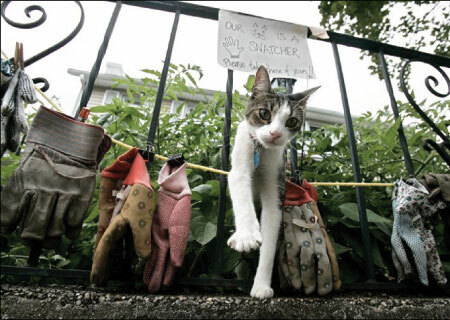 Willy the cat poses with several garden gloves that he had taken from unknown yards in Pelahm, N.Y., on Thursday July 20. Willy, who is one year old, has brought home nine pairs of gloves and five singles over several weeks, dropping them on his owners’ front or back porch. There are 7 reader responses to "Why Do Animals Collect Things?". Better these items than birds, mice, etc. Cute, cute, cute photo! Generally cats will take things and put them where their owners can find them as a sort of favor. Cats are also known to leave dead mice on their owners’ porches. Scientists say that this is a cat’s idea of showing love and helping out. I’ve even read an idea that cats assume their owners go out to hunt when they leave the house, since of course their owners are the providers of food. I read an article about a cat who steals kittens from other cats. Her babies died and over the next week or so she kept bringing home other cats’ different ageD kittens, including a couple of newborns! My cat pulls out my clean socks, scarves, and dishtowels into the middle of the floor and lays on them. I’ll come home and have 9 different articles of clothings on the carpet. Any reason for this. I’m tired of picking up my c lothes. Any help? Cats who take items and leave them on the door step or main entry into the home are basically ‘gifting’ their owner, it’s their way of saying thanks! Why does he do this? Not sure, but I think it’s probably a token of love… he’s a real momma’s boy, and I guess he likes to show his appreciation! I too have a new kitten, who places things like leaves, small little stuffed toys, moss from the back yard, and crunchy cat food in circles! Every morning I wake up to crop circles in the bedroom and on the kitchen floor, at first I thought I was going crazy, but then I saw her bringing in bit of green moss from the backyard and arrange them in a circle, on the kitchen floor. She looks part calico, tortie and tiger, a 10 lb ball of energy! Love the Moggie!